2. He actually looks good in a cowboy hat. 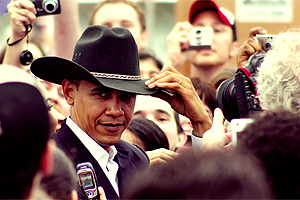 Almost nobody looks good in a cowboy hat. Maybe Clint Eastwood, but that's it. Have you noticed that the campaigns of anyone who runs against Obama just self destructs? Just don't run against him and you'll be fine. Sarah Palin didn't know that Africa was a continent, not a country.